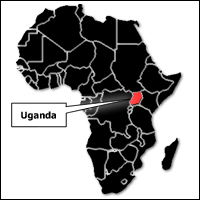 Riots have swept across the Ugandan capital, Kampala, as protesters called for an Egyptian-style uprising against their autocratic president. At least two people were killed and more than 100 wounded after soldiers fired live bullets and tear gas and beat demonstrators with sticks. Civilians fought back, blocking roads with burning tyres and pelting vehicles with rocks. The growing unrest – sparked by rising food and fuel prices – gained fresh impetus after the brutal arrest of opposition leader Kizza Besigye on Thursday. But President Yoweri Museveni, who was been in control for a quarter of a century, has met the protests with a show of force. His military police were accused of attacking innocent spectators on Friday. One victim could be seen lying in a pool of blood, apparently after being shot in the head at a local market. In the Karwerwe neighbourhood, police chased a teenager, Andrew Kibwka, with heavy wooden sticks and rained blows on him. "I thought the police were going to kill me," he said minutes later, his arm bruised and a finger bleeding. "I was telling them I'm harmless, but they just carried on. I did nothing to provoke them. They beat me because I was running away." The 18-year-old added: "I'm in pain all over my body. The police are being too brutal. I think Uganda will get worse if the president does not resign." A minibus, a taxi and other vehicles that tried to travel up the street were pelted with stones. Then soldiers in armoured vehicles appeared and fired tear gas to disperse the crowd, and people ran away in panic. Standing at a market, Robert Mayanja, who described himself as an activist, said: "What they are doing now shows that Museveni rigged the last election. "If you look at Uganda, why should we vote for him after 25 years? We have high prices, we have hospitals without medicine. Is there anything to vote for?" Mayanja, 31, said a repeat of the revolts in Egypt and Tunisia was "definitely" possible. "What we are seeing here are people who are not armed but are taking a stand against armed forces," he added. "People are ready. It's just a question of time. "We know they are going to arrest many people and put them in torture chambers. We know this regime has expired. These are the signs." Eric Mbiro, a 20-year-old student, agreed: "We are tired of this government because of the price of commodities," he said. "There is no presidency in Uganda. The president rules the country like his own home. He is a dictator. We need change." But he was more sceptical about the prospects for an uprising, saying: "We will not manage to do what they did in Egypt because people here are poor. There is too much poverty in Uganda." Military police fired live rounds, rubber bullets and tear gas at numerous burning barricades blocking the main road out of Kampala to the international airport in Entebbe and sprayed adjacent residential areas with bullets. Shell casings littered the main road, tear gas hung in the air and security forces beat local residents. In Ntinda, angry youths shouted and hurled stones and chunks of concrete at passing cars. On one corner, a man ran up to a council vehicle as it drove by and smashed the driver's window with a rock, raising cheers from onlookers. A coded sign language is already in place. Motorists who hold two fingers aloft in a "v for victory" symbol, showing they support the rebellion, are allowed to pass unharmed, but a single raised thumb is interpreted as a pro-Museveni gesture. Roads were blocked by rocks, cones, debris and burning tyres. A bare-chested man lay face down on the grass, his head being bandaged by Red Cross medics. An eyewitness said the man had been the victim of an unprovoked attack. "The military police were making people clear the road, and this boy worked for 30 minutes," Timothy Ssenfuma, a 35-year-old electrical engineer, said. "He said he wanted to go, but they beat him on the head and back until he collapsed. They were also beating up even women and young ladies just to clear the road. "They are killing innocent Ugandans who are not even involved in the uprising. We appeal to the rest of the world to help Ugandans as they have in Libya and elsewhere." A teacher, who gave his name only as Nixon, claimed the security forces had launched an indiscriminate attack, saying: "The military police came and started beating up people. "Some had to run away and others had to fight back to defend their friends. People have terrible anger at the way they were treated." The 32-year-old said he could not imagine an Egypt-like revolt in the short term. "But in the long term, I believe it can happen," he added. "The military is still strong and many of the soldiers are unwilling to turn to the side of the people. But, in time, they might get tired of beating the people. "I really look forward to it. As your friends are beaten and arrested, the professionals need to come out and organise the people." Red Cross official Richard Nataka said more than 100 injured people had been taken to five centres, including 78 , of whom 10 had gunshot wounds, at the Mulago Hospital. He said one person had died and a pickup truck brought in a second body shortly afterwards. Red Cross vehicles were arriving at the Mulago Hospital every few minutes with more casualties. Besigye has held five "walk to work" demonstrations against rising prices and what he calls a corrupt government. On Friday, demonstrators carried posters praising Besigye, and asked why police needed to use violence to arrest him. Besigye has been released on bail, but is said to be in poor health and still unable to see after pepper spray was fired into his eyes.